By Jennifer McDonald | April 19, 2013. 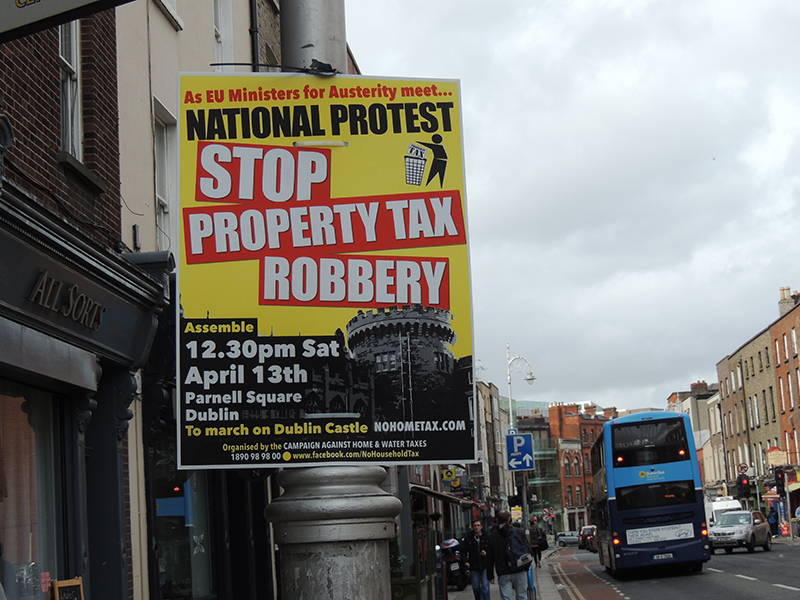 On Saturday 13 April, an estimated 5,000 to 8,000 people took to the streets of Dublin to protest against the recent property tax. Environment Minister Phil Hogan, confirmed earlier this year, it had been agreed that 80 per cent of taxes would be retained within local authority areas where properties were based. The remaining 20 per cent will go into a central fund to be used by local authorities on a “needs basis,” said a spokesperson for the Department of Environment. “The local authorities have been cut by 20 per cent, leading to parks being closed early, roads in suburban areas only being swept once every three months by the Councils and the privatisation of the bin service,” said Local TD, Joan Collins. However, Collins stresses, that this tax will not improve local services and said she supports “a tax on wealth and property, not a family home tax”. Local resident, Cliona Hayden said, “I don’t see the point of the tax. I already pay for the services I use in my community”. Homeowners have complained in recent weeks, tax estimates for their houses and others in their area, are over or under valued on various property tax websites. This is mainly due to the fact that certain sites such as Revenue.ie base their assessment on how old the property is and its location. However, property websites have also account for any extensions made to the houses and its number of bedrooms. 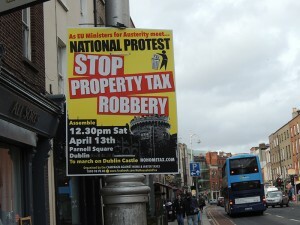 Revenue.ie began sending out letters in March to 1.6m households, demanding the property tax payment. The letter includes a “notice of estimate of local property tax”, but householders have to calculate the amount they need to pay themselves. However, due to errors made by the Revenue Commission letters demanding the tax payment have also been sent to children and non- property owners. Revenue property tax manager, Vivienne Dempsey said, “We are saying that it [the property website] is another piece of information. We’re encouraging property owners to look at as many sources of information as they can”. Joan Collins said, “We believe this confusion is an attempt to engage people to contact the Revenue Commission. The valuation process is a joke”.